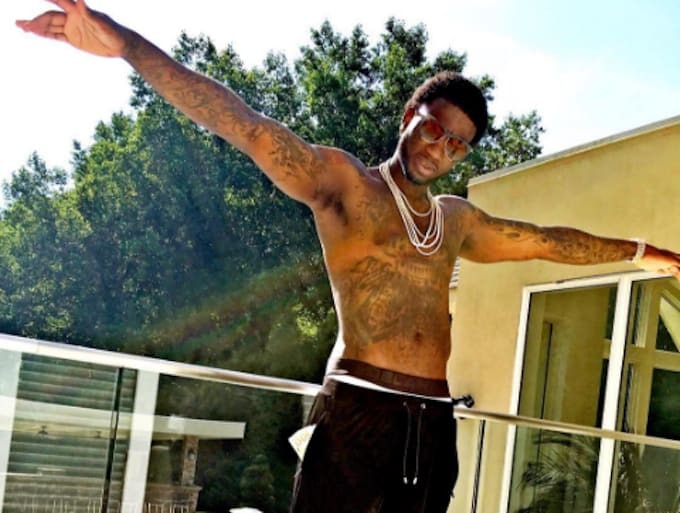 Gucci Mane isn&apos;t wasting any time after finally being released from prison last week. Not even 24 hours after his release, the rapper dropped a new track "First Day Out the Feds," and now it appears he is teasing an upcoming clothing line. Gucci&apos;s girlfriend Keyshia Ka&apos;oir shared two videos over the weekend that purportedly show Guwop&apos;s new line. In one clip, Gucci is seen poolside wearing a bright pink hoodie with "Delantic" branded across the front. In the video you can hear her say, "that is your new clothing line, that&apos;s dope." She captioned the video, "Delantic coming soon." Another clip shows a black and a white pair of boxer briefs with the same Delantic branding, which Ka&apos;oir says is also part of his clothing line. Gucci later shared a photo showcasing the briefs (and a much slimmer physique) on Instagram. Maybe he was inspired by all that "Free Gucci" merch? ​Gucci was sentenced after pleading guilty to fire arm possession in 2014. He was originally set to be released in September, but was granted his freedom early. After two years in federal custody, fans are clearly eager for anything new Gucci puts out. His new single was streamed over 1 million times in a day. Gucci has yet to reveal any additional details or a release date for the clothing line, but stay tuned.